One of the major problems encountered in qualitative and quantitative determination of residual pesticides by gas chromatography is the matrix effects. Matrix components have a considerable effect on the way analysis is conducted and the quality of results obtained, introducing problems such as inaccurate quantification, low analyte detectability and reporting of false positive or even false negative results. It was aimed to develop and validate a suitable method for counteracting the matrix effects so as to improve the detection and quantification of selected organochlorine pesticide residues from real water samples. The real water samples used were sampled from three points along the Jukskei River catchment area in Gauteng, South Africa for a period of 7 months from January to July 2010 so as to create a representative sample. An automated solid phase extraction (SPE) method coupled to Gas Chromatography- Mass Spectrometry (GC-MS) method for the analysis of 20 selected organochlorine pesticides was developed and validated for the purposes of studying the matrix effects. The analytical method showed a significant degree of validity when tested against parameters such as linearity, repeatability and sensitivity. Endosulphan beta, 4,4’ Dichlorodiphenyldichloroethane, and Heptachlor-epoxide had the broadest linear calibration ranges of 1 ppm- 0.0156 ppm. Benzene hexachloride (BHC) delta and Lindane had the lowest statistical limits of detection of 0.018 ppm. Statistical hypothesis testing indicated that there was significant linearity in all selected organochlorine calibration curves. Four different reversed sorbent phases, including LC18, SC18- E and Strata-X (styrene divinyl benzene) were tested for organochlorine retention efficiency. The LC-18 200 mg cartridge proved to be the most robust and effective sorbent phase as it produced better recoveries varying from 90-130% for most analytes. A breakthrough volume of 100 mL for the LC-18 200 mg cartridge was determined using an optimum matrix load curve. 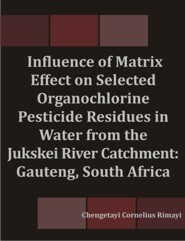 It was then concluded that the method developed was suitable for further research towards the influence of the matrix on selective determination of the selected organochlorine pesticides. Four different calibration methods, namely matrix-free external standard, matrix-matched external standard, matrix-free internal standard and matrix-matched internal standard were applied to test the efficiency of computing recoveries. All calibration curves for the 20 organochlorine pesticides showed significant linearity > 0.99 when plotted on both Chemstation and Excel. The calibration methods were tested on three different matrices composed of a high sample matrix (synthetic matrix), a low sample matrix (real sample matrix) and a no sample matrix (ultrapure water). Statistical hypothesis testing led to the decision that there are significant differences between the mean recoveries of the three water sample matrices and also that the differences in the mean recoveries of the three sample matrices are independent of the both the two calibration techniques (internal standard and external standard) and calibration types (matrix-matched and matrix-free) applied. This led to the overall conclusion that the matrix effects have an overwhelming influence on the selective determination of the selected organochlorine pesticides.